Tint Tint Travels & Tours, part of the Tint Tint Myanmar Group of Companies, is based in Yangon, Myanmar, and also has offices in Mandalay, Bagan and Inle Lake. 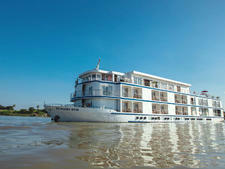 Founded in 2009, the company owns four river cruise ships that sail the Irrawaddy. It also sells other cruise vacations and land-based cultural, trekking and cycling tours in Myanmar. The company has introduced environmental initiatives to ensure its ships are as environmentally friendly as possible, which include making sure no garbage enters the ecosystem and recycling all food scraps to keep waste to a minimum. It supports and solely funds a medical clinic in the village of Shwe Pyi Thar, which provides health care to local residents, and plans to open a second clinic in 2016. Tint Tint also supports a number of charitable programs in Myanmar. 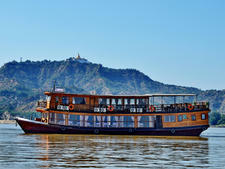 Tint Tint offers cruises on Myanmar's (Burma's) Irrawaddy River between Mandalay to Bagan on its fleet of four vessels. 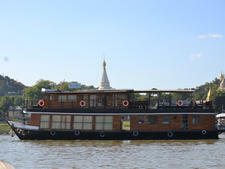 It also offers charter-only cruises on the Chindwin River on the Makara Queen. The vessels all have a high crew-to-passenger ratio and are constructed from local materials to provide a very traditional atmosphere. Passengers will also find cabins decorated with colorful silks and local handicrafts. The atmosphere onboard is informal, with ample deck areas for relaxing in chairs or loungers. The sun decks include a shaded alfresco dining area, with an inside saloon and bar that can also be used for meals. The largest ship in the fleet has an onboard masseuse, shop and other facilities. Meals are a mix of Burman, Asian and Western cuisine, and dietary requirements can be accommodated. Chefs use fresh, locally sourced ingredients and some itineraries included cooking classes. Cabins on all ships have en-suite bathrooms and all cruises include complimentary water, tea and coffee. Tint Tint's travelers are predominantly from Western Europe, in particular British, French and Germans, with a mix of other nationalities including North Americans and Australians. They are usually well-traveled with a sense of adventure. Tint Tint Myanmar Group of Companies has four river ships: Makara Queen, Irrawaddy Princess II, RV Princess Royal and RV Yandabo. The largest is 50-passenger Makara Queen, which includes two suites with private balconies. Facilities include a pool, small cinema room, shop, currency exchange and spa with two treatment rooms. 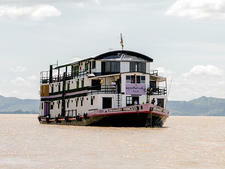 For passengers that prefer shorter itineraries, the Irrawaddy Princess II offers one- and two-night cruises. It accommodates 40 passengers and has a crew of 20. Tint Tint's two small boutique vessels also offer short sailings. RV Princess Royal, which carries 12 passengers and a crew of 13, offers two-night cruises. There is an even larger crew-to-passenger ratio on the RV Yandabo, which also has 13 crew members and carries just eight passengers. This vessel sails on one- and two-night cruises.